A-Ma Temple: Breathe in wafts of incense as you wander the leafy layers of the temple. There is no cost to enter and you are allowed to take pictures within the temple, as long as you don’t interrupt people praying to the Goddess of Fishermen. Bungy Jump Macau Tower: A truly bucket-list challenge, this is the highest bungy jump in the world. With a jump height of 233 meters and free fall of 6 seconds, you can watch on as even the brave squirm, or take the plunge yourself. 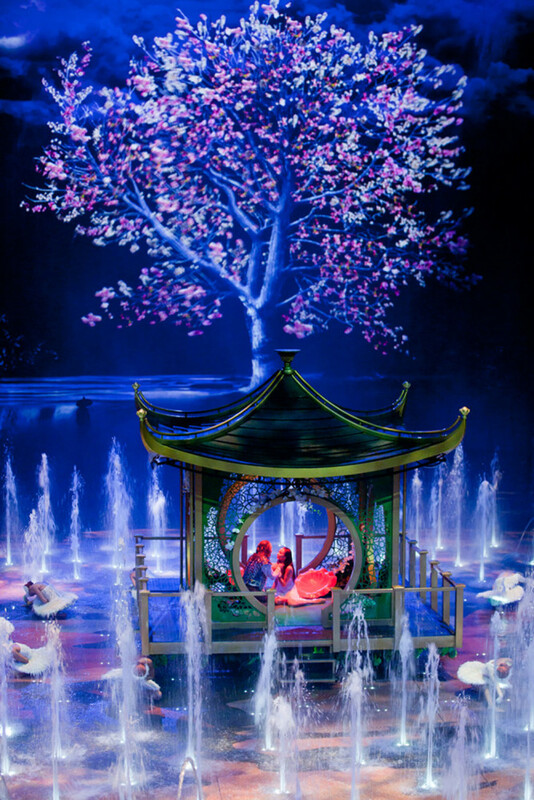 House of Dancing Water Show: This is a MUST. High diving acrobatics, a kidnapped princess and a dashing prince – it’s a love story of epic proportion. Avoid sitting in the first three rows though unless you’re prepared to get a little wet. Ruins of St Paul: Built by the Geswicks in the early 1600s the Ruins of St Paul is the earliest evidence of European construction in all of China. As Macau’s most famous landmark it can be a bit of a jostle for prime selfie-snapping position here, especially since it’s a popular wedding photo backdrop for Chinese lovers. However standing beneath this towering façade is well worth the crowds. Senado Square Open Air Markets: Bustling market lanes jut from the main Portuguese piazza selling a variety of clothes, shoes and vintage trinkets. Prices are very honest but you can barter for a small discount. 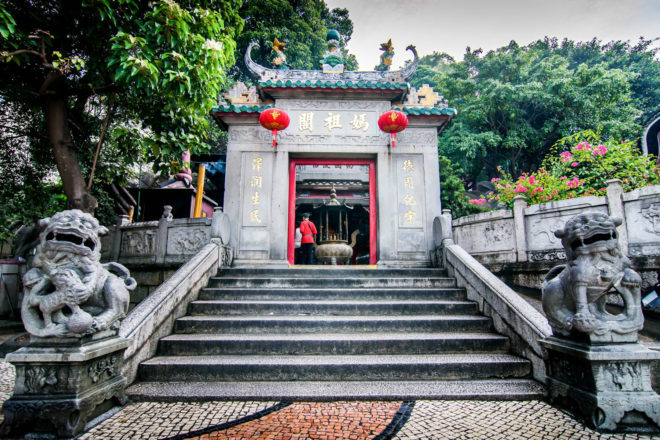 This is where to come to extend your palate with local delicacies for sale such as live crabs wrapped in grass and 1000-year-old duck eggs. There’s also your more conventional market finds including dried meat, fresh vegetables, fruit and seafood. It’s easy on the pocket too – you can fill a shopping basket for pocket change. Authentic Portuguese cuisine doesn’t come much more tasty than at O’Manuel restaurant in Taipa. Manuel himself will welcome you through the door, pour you a glass of Vinho Verde and slice ribbons of black leg ham that has been winded (hung in the wind) for three years. You can expect to pay $21 for a starter and up to $50 for a main here, but this Michelin-recommended restaurant is definitely worth the price tag. Signature dishes include gratinate goat cheese with acacia honey and Portuguese duck rice. Be sure to ask for a taste of their homemade cherry wine. For a spot of dancefloor action, Lions Bar is a favourite haunt for all age groups, renowned for its live soul, jazz and pop music performances. An endearing English-style pub, this is a great place to chat to local expats over a pint and simple pub grub. A somewhat more chic bar option, Sky 21 is ideal territory to glam up and sip cocktails beneath the stars. The open-air roof bar has live music nights and performances by guest DJs. A truly bucket-list challenge, this is the highest bungy jump in the world. With a jump height of 233 meters and free fall of six seconds, you can watch on as even the brave squirm, or take the plunge yourself. 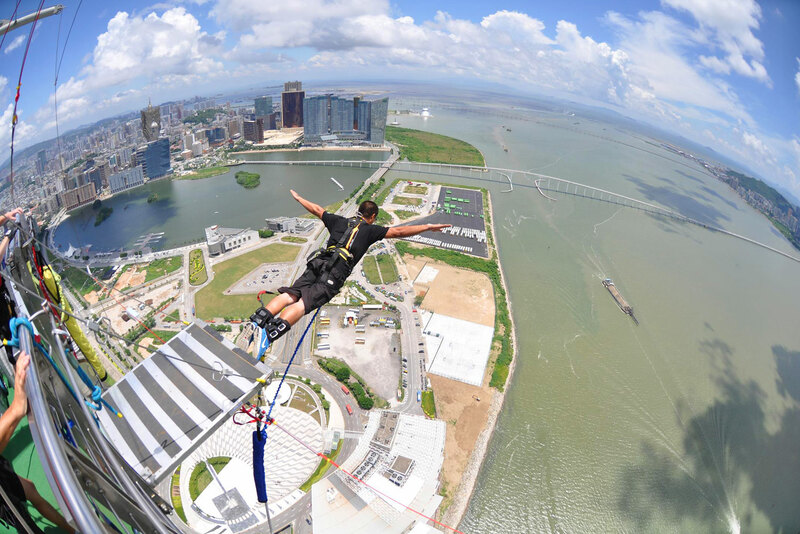 If strapping a rope around your legs and launching into space isn’t for you, then experience Macau Tower by strolling around, leaning off or sitting on the edge of it. At 233 meters high it’s easier said than done. Built by the Geswicks in the early 1600s, the Ruins of St Paul is the earliest evidence of European construction in all of China. As Macau’s most famous landmark it can be a bit of a jostle for prime selfie-snapping position here, especially since it’s a popular wedding photo backdrop for Chinese lovers. That said, standing beneath this towering façade is well worth the crowds. Breathe in wafts of incense as you wander the leafy layers of the temple. There is no cost to enter and you are allowed to take pictures within the temple, as long as you don’t interrupt people praying to the Goddess of Fishermen. This is a MUST. High diving acrobatics, a kidnapped princess and a dashing prince – it’s a love story of epic proportion. Avoid sitting in the first three rows though unless you’re prepared to get a little wet. Fun for kids and big kids at heart, here you can meet your favourite DreamWorks characters like Shrek, Puss in Boots and the Madagascar crew. Just be prepared to sing Circus, Afro, Circus, Afro for the rest of the day. 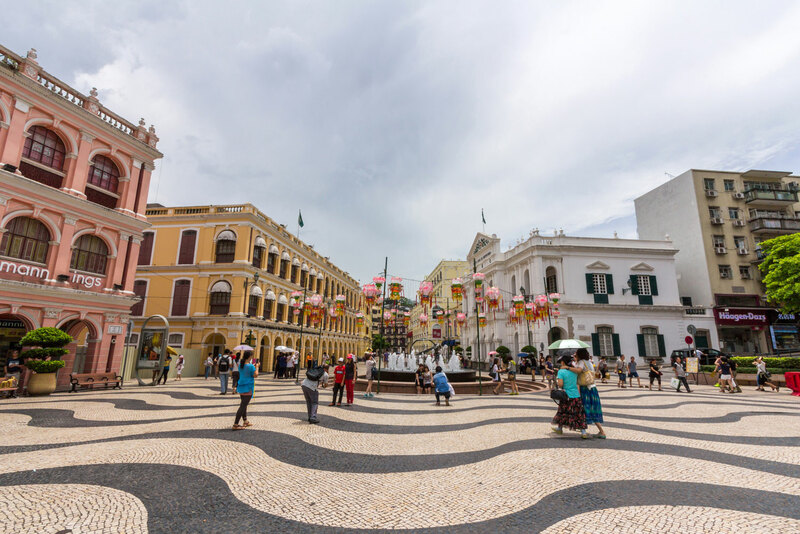 Twenty percent of Macau is gardens and park; little oases scattered throughout the city. It’s a Chinese tradition for men to walk their birds here and you will spot them sitting in parks under the shade of a tree. Bustling market lanes jut from the main Portuguese piazza selling a variety of clothes, shoes and vintage trinkets. Prices are very honest but you can barter for a small discount. Located at the base of the Ruins of St Paul, this is a great place to pick up cheap t-shirts, caps, trinkets and yummy treats to take back to family and friends. Shop high fashion brands such as Escada and Cartier, quality children’s wear, duty-free cosmetics, jewellery and inexpensive electronic goods. If you can find time to climb out of your marble bath and float down to breakfast, the Conrad puts on a killer spread of Chinese, Japanese and American cuisine. The in-room Nespresso machine is also worth a workout. King deluxe suites start from approximately $400 per night. The Holiday Inn shares The Conrad complex, so Mum and Dad can soak up a five-star stay while the kids can shack up nearby for a more affordable price tag. Shrekfast is included in most packages. The DreamWorks package starts at approximately $300. If you want to splash out, Banyan Tree suites have an in-room pool, as well as a full menu of delicious creature comforts. The Grand Cotai Suite is yours (pool and all) for approximately $550 per night. 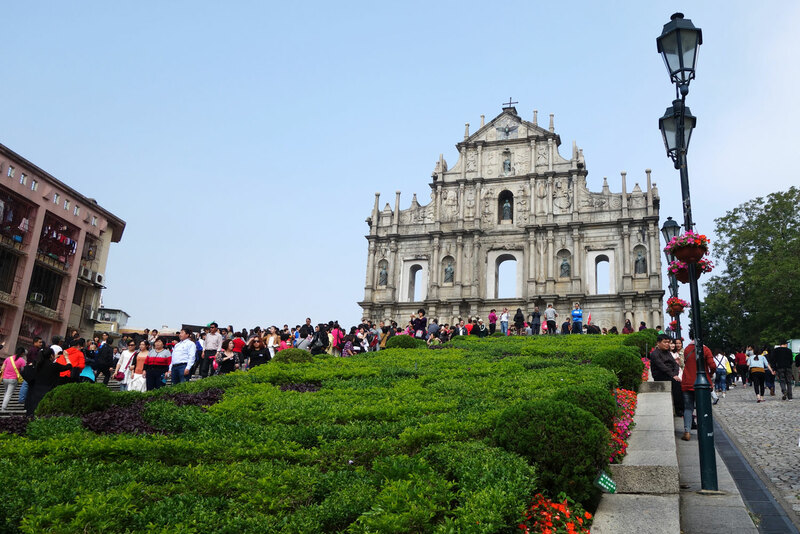 Take the morning flight to China with Cathay Pacific or Qantas and there is an easy connection to Macau with Turbo Jet. You can buy a ferry ticket for around $30 one way before you leave through immigration, and Turbo Jet staff will collect your bags from the arrival hall. If you are visiting Hong Kong as well as Macau on your travels, be aware you can use Hong Kong dollars in Macau however the Macanese pataca is not accepted in Hong Kong.